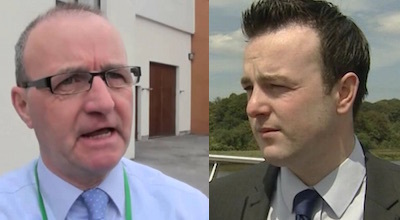 Amid ongoing public recriminations and street protests against the ‘Fresh Start’ agreement, Jim Gibney defends Sinn Fein’s negotiators, while the SDLP’s new leader Colum Eastwood condemns them. The main objective for all political parties going into the latest negotiations should have been to emerge at the end with a comprehensive and inclusive agreement which all of society could accept and benefit from. The negotiations were not about satisfying a Sinn Fein wish list but about addressing the needs of all of our people emerging from decades of armed and political conflict. A comprehensive and inclusive agreement was certainly Sinn Féin’s main objective and at different stages over the last few weeks the Irish government, the SDLP, the unionist and Alliance parties shared that objective. Unfortunately as the negotiations concluded it was left to Sinn Fein alone to argue for and try to achieve a comprehensive and inclusive deal. And in the circumstances where Sinn Fein alone was trying to achieve such an outcome then this objective was always in doubt. It is worth reminding ourselves that there were five political parties and two governments involved in the negotiations. And although Sinn Fein carries considerable influence and negotiating strength and skill the odds were stacked against it achieving an all-embracing deal. In these circumstances, to secure a deal at all, given the issues under discussion, was progress in itself. The fact that it is an incomplete and therefore an imperfect deal does not invalidate it. As a result of the agreement the peace and political processes are more secure than they were a few months ago. Then the political process was facing collapse due to the unionist parties cynically exploiting the tragic deaths of Gerard ‘Jock’ Davison and Kevin McGuigan and the Tory government’s attempts to impose welfare cuts on the people of the north. As a result of the agreement those in need of welfare assistance will receive it: £585m is available to assist those in need. Professor Eileen Evason, an eminent authority on the needs of the most vulnerable, will chair a panel to advise on how the money can best be used to help those in need of it. As a result of the agreement the north’s public services and the general economy will have much more money invested in it, some £1bn, including new money and funds allocated under the Stormont House Agreement last year. Of course a very important constituency of people are deeply disappointed and angry that their needs have once again not been met. And Sinn Fein shares their deep disappointment. Those relatives, whether nationalist or unionist, in need of the truth about the death of their loved ones have been denied the truth by the British government and no one else. No one else but the British government can deliver this aspect of the truth. It has brazenly and repeatedly, in these negotiations, refused to agree mechanisms to disclose the truth about its armed forces and intelligence agencies involvement in state killings and state assisted killings through collusion. To deny access to the truth the British government is hiding behind claims that its national security is in jeopardy. But this is a smokescreen to protect those at the highest levels of the British state who were involved in the killings. In an options paper submitted to the British government Sinn Fein offered a way around its national security concerns and suggested a number of ways in which it could agree to deliver the level of disclosure required by families which did not infringe on its national security. This paper was rejected. The issue of national security and the positive role human rights based initiatives can have in a society emerging from conflict were very much on the mind of the UN’s Special Rapporteur, Pablo de Greiff, when he issued an interim report after visiting the north for ten days recently. Regarding national security he said that it should not be used in a ‘blanket’ manner to block disclosure of the truth and that the ‘notion of human rights’ not ‘turn-taking’ (vengeance) was the only basis on which progress about the past could be made. The British government have yet to accept that very obvious reality. Sinn Fein are famed for telling a good story. Credit where credit is due, I think they’ve been pretty good at it too. The heart of their narrative told us they were the best negotiators in the land. That they and they alone were the strong men, that they and they alone would stay in the room for however long it took. That they and they alone wouldn’t budge until their bottom lines were met. Since the beginning of their political journey they’ve voiced that story with an abundance of self-confidence and with very little humility. It’s been a good story and they won plenty of votes on the back of it. But even the best of stories come to an end. Last week’s so-called ‘Fresh Start’ deal definitively marked that end. Much of that deal has now been proven to be so transparently awful that Sinn Féin’s chief negotiators are finding it difficult to hide their shame. And ashamed they should be. After promising for two years that they’d stand up to the Tories and fight the good fight, they’ve not only completely capitulated on their promises, they’ve surrendered their responsibilities to none other than George Osborne. They genuinely convinced many of this society’s most vulnerable that their benefits would be protected. It is no wonder these same people are now so genuinely angry. On welfare reform, they’ve negotiated away around £240 million of protections for the most vulnerable. Bizarrely, they negotiated a package of mitigations on tax credits with David Cameron in 10 Downing Street when next door in number 11 his Chancellor was planning to announce that they weren’t even going ahead. By any measure, that’s what’s called getting your eye wiped. Worse still, their chief negotiators then voted to hand control of welfare powers away from the Assembly and over to the Tories for the next 12 months. These are the same Tories who still plan to take £12 billion out of the welfare budget. This is probably the first occasion where any nationalist or republican party on this island has willingly surrendered hard won powers back into the hands of the British Government. On the economy, they’ve negotiated a deficit for our future. Whilst placing all their eggs in the corporation tax basket, they’ve failed to negotiate the infrastructure that will give this measure real effect. Reduced corporation tax is ineffective with reduced student numbers and an incomplete A5 and A6. Without this broader agenda of investment in infrastructure and skills, business won’t end up thanking Stormont for the mercy of a little less taxation in an otherwise arid economic environment. Worst of all, their negotiators walked away from dealing with the past, after swearing they’d never abandon victims and survivors. It is telling they have not called for the British Government to publish the Bill. We have. At this point a fair question to ask is what alternative was presented? It’s the right question and a necessary one. There was an alternative. We in the SDLP presented seven comprehensive policy papers to the parties, mapping our way forward on the economy, welfare, the past and proposals on organised crime. Seven papers in total, Sinn Fein presented none. That inability to put in the hard yards of policy development has led to Sinn Féin being sold this pup of a deal. Their long crafted story of skilled negotiation has been exposed as a myth. They’re right to be rattled. Electorates are seldom forgiving of those who promise gold and deliver tin. Just ask Nick Clegg. But whatever the difficulties of Sinn Féin, our real concern has to be difficulties which this deal will mean for this society. Dealing with those will necessitate a fundamental shift in our politics. It’s long since time that we got away from simply building stories and myths. They’re not the stuff that good and healthy governance is made of. Making Northern Ireland work means building a new normal, where political parties are measured by the quality of their ideas and on their delivery for our people. That’s the SDLP I’m building. That’s the SDLP which will be on offer at next May’s elections.